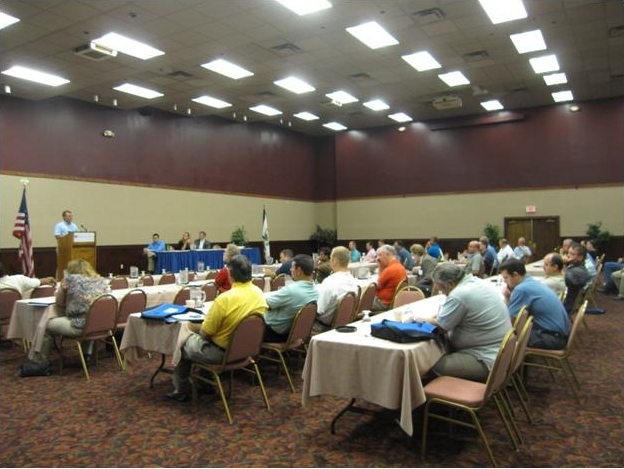 The National Rural ITS Conference (NRITS) was held August 1-4, 2010, in Huntington, West Virginia. Hosted by the Nick J. Rahall II Appalachian Transportation Institute, the conference was titled The Bridge to Success: Engineering the Future of Rural ITS. Over 230 participants from around the United States and North America attended technical sessions complemented by tours, full and half-day trainings, networking functions and a vendor exhibition, all focused on Rural ITS. A presentation by David Veneziano and Doug Galarus was selected for presentation in the NRITS session entitled Real-Time and Expanded Traveler Information Systems. This session shared various approaches being taken to improve the sharing and dissemination of traveler information. Doug Galarus explained how the web-based One Stop Shop platform has been created and ongoing development efforts to provide route-specific, real-time, highway-based traveler information. Doug explained many of the different features of the One Stop Shop and then showed the audience some screenshots taken off the website during active winter weather events. The session was very well attended as you can see by the photo below. Doug received a number of questions, and the feedback received from the session as well as discussions afterwards will be very valuable.